Handcrafted and inspired by the gorgeous hues of the season, the You're Precious Bouquet is full of sweet sentiment for your favorite person. 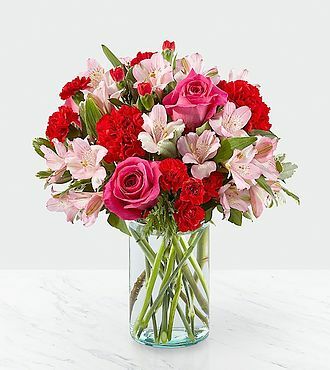 Hot pink roses, red carnations, pink alstroemeria, and pale pink carnations come together in a clear glass vase to make any room feel beautiful and light. From special birthdays to simply just because, this arrangement is a stunning gift to give your loved ones for every occasion.